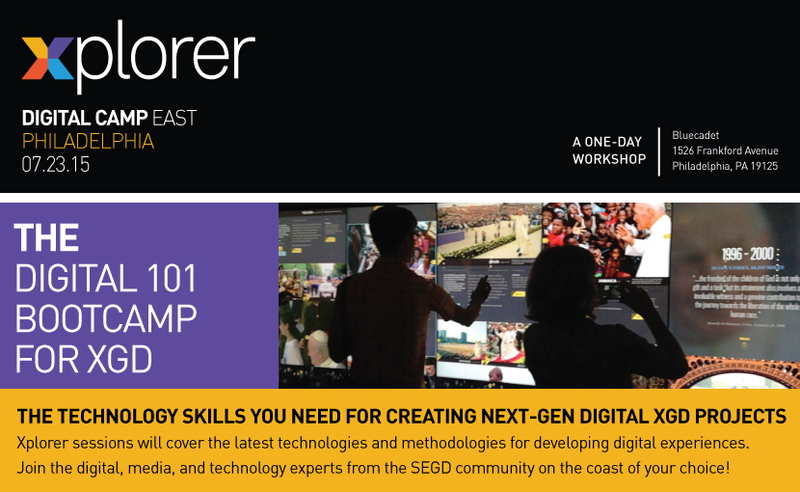 SEGD’s Xplorer Digital 101 Camp is a one-day, hands-on workshop designed for creatives looking to enhance their digital skillsets with the foundations of content creation and technology integration. Get the know-how you need from experienced practitioners, build your digital vocabulary, and gain a basic foundation of understanding about digital media, processes, and possibilities for your clients. Sessions include creating time-based media from image, video, type, and data-sourced content. 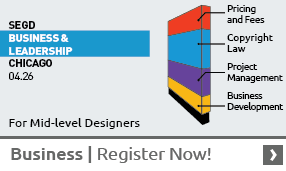 Learn how to develop and integrate content though a range of interfaces, including screen, projection, mobile devices, and interactive sensors. Sharpen your digital skills and be ready take them back to the office and put them to work right away on your next XGD project! This course will be instructed by top digital professionals from the PHL-NYC area and will allow for personal interaction with all participants through a focused workshop size. Can't make it to Xplorer Philadelphia? Join us in Seattle in August! Sam Stubblefield and Christian Marc Schmidt both mix art, architecture, technology, and people, and see what happens. Stubblefield, experience design studio leader at NBBJ, and Schmidt, founder and principal of Seattle-based Schema, are true Xplorers. Join them at SEGD’s Xplorer Digital Camp West—August 6 in Seattle—and they'll inspire you to Xplore and Xperiment! Being an experiential graphic designer these days is like being an explorer—charting the course of your business or career, scanning the horizon for new opportunities, and scouting the right tools and skills to take advantages of those opportunities. That’s what SEGD’s Xplorer Digital Camps are all about: making sure you’re prepared for the increasingly digital and data-enabled projects in your future. 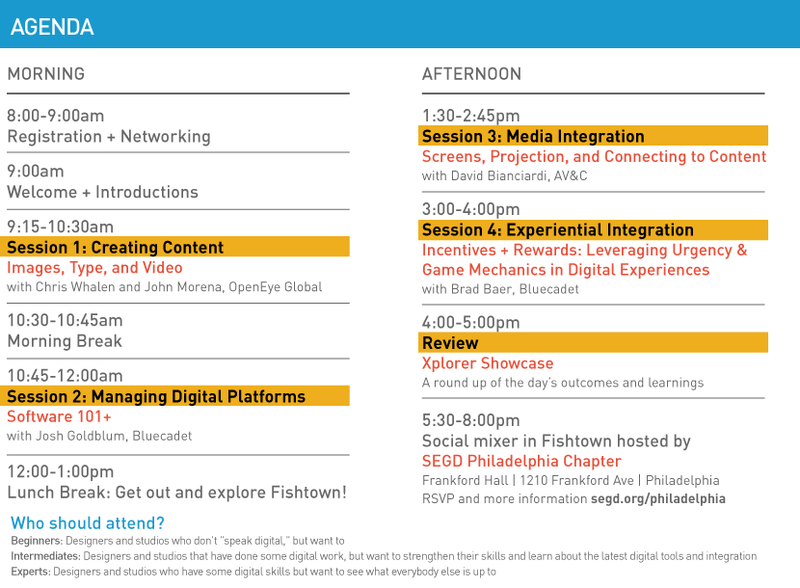 >> Attend SEGD Xplorer Digital Camps in Philadelphia or Seattle this summer! As Bluecadet’s Founder and CEO, Josh Goldblum has devoted his career to doing award-winning work with organizations like the MoMA, Smithsonian Institution, Doctors Without Borders, and National Geographic to educate, engage, and entertain through websites, mobile apps, interactive installations, and immersive environments. Chris Whalen is the Creative Director at OpenEye Global, a firm specializing in digital experience design in retail spaces. He’s very enthusiastic about the future of user interactions with digital screens and signage, and is a perpetual learner alongside collaborator John Morena, an expert in motion graphics, animation and video. What is fascinating about all disruption cycles is the solution that ultimately disrupts is not usually a completely new-to-the-world invention. Take the Ford Model T or the Wright Brothers Wright Flyer. Making gliders with humans flying on them was not new. The final piece of the puzzle though--how to make the flight stable--was! The personal computer was a similar story. The Apple 2 was not the first personal computer, but it was the first to combine a keyboard and screen with the processor, thus making it usable.